Instagram is one of the best social media that allows you to share your videos and pictures as well as viewing your followers own. 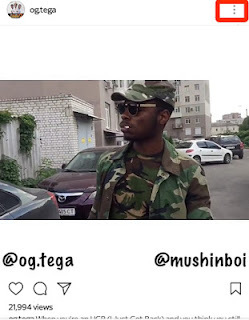 Viewing Instagram video or photo online with the app or web can be data consuming everytime so there is need to instagram photo or video to your iPhone, Android or other smart phones. Instagram app at default hinders you from download instagram photos or video online but with some little trick, you can download it offline to your smartphone. There are lots of medium which you can use to download instagram video online but in this tutorial, it will be based in using Ucmini. 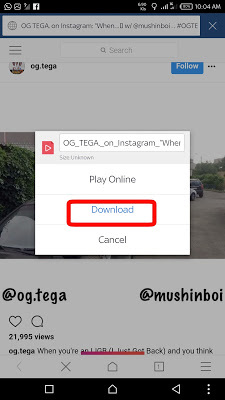 ✔️Login to your Instagram account using the Instagram App and locate the video you want to download and click on the 3 dots and the right hand side of the video. ✔️After clicking on the Copy Share URL option, you will see a loading sign just let it finish it's loading and you will see this notification below the video post. ✔️Open your UC mini browser and click and hold the URL box and you will see paste option that will popup. 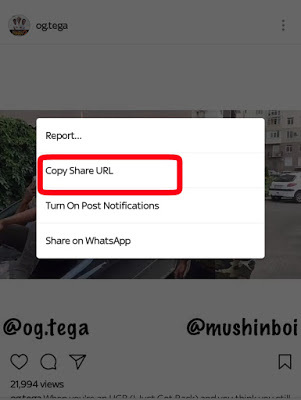 Click on the paste option and your instagram video URL you copied will be paste than click on GO. Kindly click on Download and your video will start downloading. In case the video was not able to play after, just go to your file manager and locate UC browser folder and rename the video from Uvideo to MP4 . What do you think..? Is it helpful? Would like to hear from you via the comments.